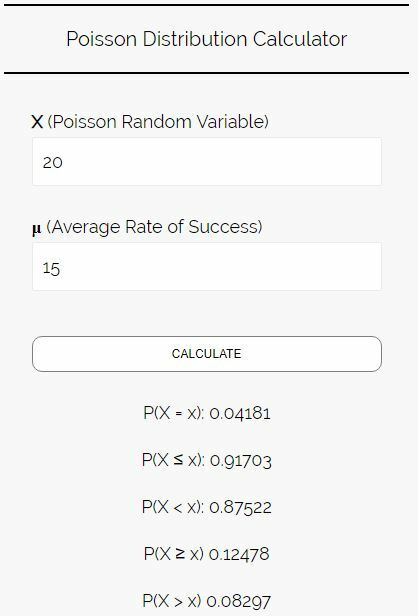 A Poisson random variable is the number of successes, denoted x, that results from a Poisson experiment, and it follows a Poisson distribution. P(x successes) = (e-μ) (μx) / x! where e is equal to about 2.71828. Let’s walk through some examples to gain a better understanding of the Poisson distribution. 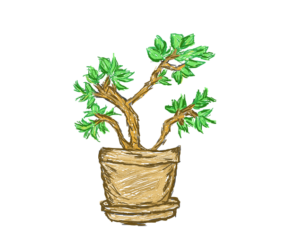 Example 1: A hardware store sells 3 hammers per day on average. What is the probability that they will sell 5 hammers on a given day? Step 1: Identify the mean number of hammers sold per day (μ) and the number of hammers we’re interested in analyzing (x). P(sell 5 hammers) = (e-μ) (μx) / x! P(sell 5 hammers) = (e-3) (35) / 5! The probability that the hardware store sells 5 hammers on a given day is equal to 0.10082. Example 2: A certain grocery store sells 15 cans of tuna per day on average. What is the probability that this store sells more than 20 cans of tuna in a given day? Step 1: Identify the mean number of cans sold per day (μ) and the number of cans we’re interested in analyzing (x). Step 2: Since we are finding a cumulative probability (i.e. 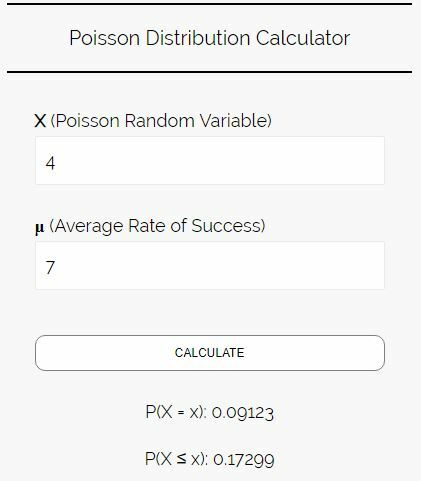 the combined probability that we sell 21 cans or 22 cans or 23 cans…), it’s easier to use the Poisson distribution calculator. The probability that this store sells more than 20 cans of tuna in a given day is 0.08297. Example 3: A certain sporting goods store sells seven basketballs per day on average. What is the probability that this store sells four or less basketballs in a given day? Step 1: Identify the mean number of basketballs sold per day (μ) and the number of basketballs we’re interested in analyzing (x). Step 2: Since we are finding a cumulative probability (i.e. 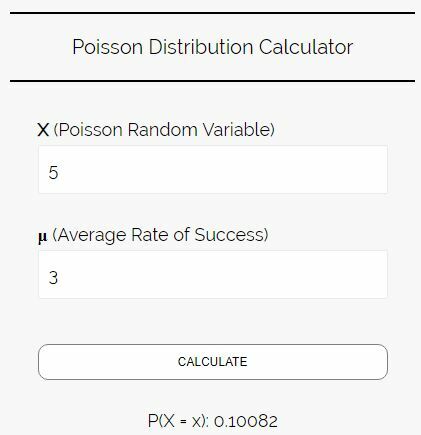 the combined probability that we sell 4 or less basketballs), it’s easier to use the Poisson distribution calculator. The probability that this store sells four or less basketballs in a given day is 0.17299. 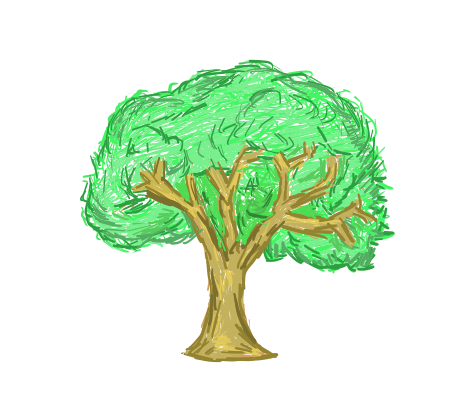 Next What is a Sampling Distribution?